Washington NFL BJs scandal: Jessica McCloughan accuses Dianna Russini, apologizes. Washington general manager Scot McCloughan. The Washington NFL franchise is continually developing surprising new ways to debase the very ideas of honesty and dignity, and with the 2015 football season about to begin, it rolled out a real doozy of an embarrassment to get the year started. Namely: The general manager’s wife used Twitter to accuse a female ESPN reporter of trading “BJs” for information, then apologized for it just hours after the team’s senior vice president for PR claimed to reporters that the messages had come from a faked account. 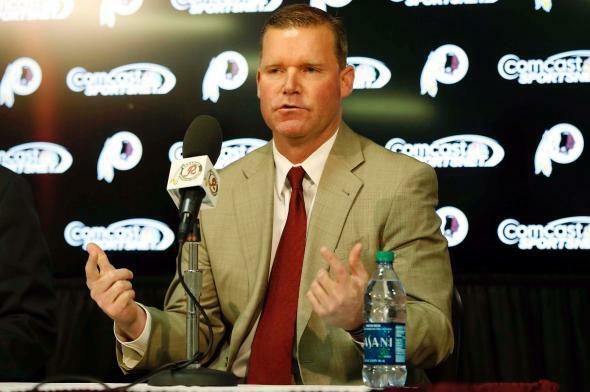 The team says McCloughan’s wife did not send the tweet in question. Redskins Senior Vice President Tony Wyllie tells PFT that Jessica McCloughan did not post the tweet, it came from a fake account, and it has been forwarded to the NFL’s security department. The Twitter account has since been deleted. I deeply apologize for the disparaging remarks about an ESPN reporter on my personal Twitter account. The comment was unfounded and inappropriate, and I have the utmost respect for both the reporter and ESPN.